Day 3 of Shanghai Masters continued as some unexpected results are produced. 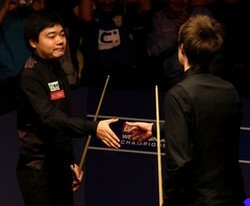 Two Young Talents as well as the semi-finalists of World Championship were crashed out of Shanghai in the first round. Judd Trump lost to Staurt Bingham, the latest ranking event winner 1-5 while Ding was defeated 3-5 by Martin Gould. Trump and Ding are both the hot picks to win the tournament but they picked their bags today. No more fancy cars, Work! Confident Bingham nailed his 5-1 victory with 129 in the opener and 112. Trump made a maximum attempt when he was 0-3 down. The attempt ended when the thirteenth red was missed on 96. It was also the only frame that Trump took in the match. Bingham's Australia title boosted his confidence: "There's no reason why I can't win this. If I play as well as I did in Australia I can do it. I've been playing well for 18 months now and I just want to keep it going." Bingham will battle against John Higgins in the Last 16. Higgins took 5-3 win over Mark Davis with 112 in opener and 68. "I've only ever won one ranking tournament in Asia, and that was here in Shanghai in 1999. So it's been a long time and I'd love to win another one." Local Hero Ding Junhui suffered a turnover defeat 3-5 by Martin Gould. The Chinese shone in the first three frames before Gould pulls one back. Ding was holding a 3-1 advantage over Gould during mid session. The Pinner Potter turned on after failing his 147 attempt in the fifth frame that stopped at 88. Ding was unable to stop Gould to reach the match point 4-3. Gould took risks to win on the final pink and black to capture his victory 5-3. Gould will meet Matthew Stevens who beaten Stephen Lee 5-2. There will be no Chinese player completing in the last 16. Ding is defeated as well as Liang Wenbo lost to Neil Robertson 1-5. Mark Williams easily through to the next round as he whitewashed Andrew Higginson. Graeme Dott early exit in the competition due to his lost to the Hitman, Michael Holt 2-5.